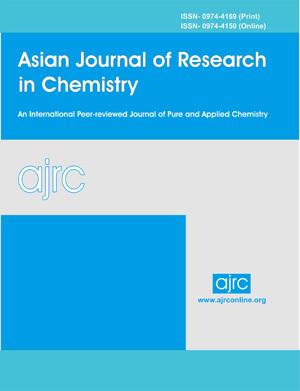 Asian Journal of Research in Chemistry (AJRC) (ISSN: print-0974-4169, Online-0974-4150) is an international, peer-reviewed journal devoted to pure and applied chemistry. AJRC publishes Original Research Articles, Short Communications, Review Articles in all aspects of chemistry. Topics covered including the traditional areas of analytical, inorganic, organic, biochemistry, forensic, physical-theoretical chemistry as well as newer interdisciplinary areas such as agriculture, materials science, computational, medicine, spectroscopy, polymers, supramolecular, surface, chemical physics, biological, medicinal/ drugs, environmental and pharmaceutical chemistry. The journal is published quarterly every year in last week of March, June, September and December. From January 2011, is monthly and shall be published every year in last week of Month. . . . . Read more. Online since Thursday, Apr 18, 2019 Accessed 91 times. N V L Suvarchala Reddy V, Sneha J Anarthe, Ganga Raju M, Akhila M, Pooja Raj G.B. Spectrophotometric simultaneous determination of Empagliflozin and Metformin in combined tablet dosage form by absorbance corrected method, area under curve method, and dual wavelength spectrophotometry.